The PerMix PMS series Multi-shaft Mixer is a revolutionary universal multi-processing mixer which is designed to serve a wide variety of industries in many different processes. It provides a unique three-way mixing action by combining slowly running elements with a rapidly running element. The PerMix PMS series Multi-shaft Mixer therefore is not limited to the simple production of emulsions, suspensions and other homogenous products, but covers the entire manufacturing process - from feeding the components, to the well-deaerated and ready-for-packaging product. During operation of the PerMix PMS series Multi-shaft Mixer, the high speed blade provides high shear to disperse the materials, while the low speed blade keeps feeding the high speed blade by scraping material mass from near the wall. The intensive action produced by the elements ensures not only a thorough mixing of the product but also exposes it to the vacuum prevailing in the vessel. The air bubbles in the product being mixed continually rise to the surface, burst under the effect of the vacuum and exit through the vacuum pump. 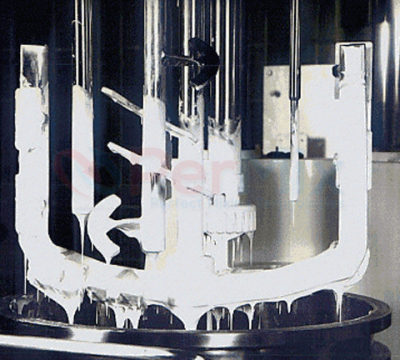 The ongoing deaeration process increases the chemical stability of the product and prevents unwanted chemical reactions such as oxidation, ensures greater measuring precision on the part of the filling machines, accelerates emulsion formation, and produces a pleasant, smooth and shiny end product. 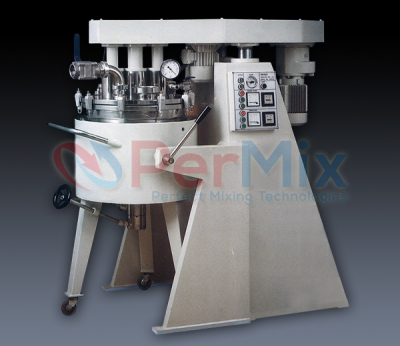 The PerMix PMS series Multi-shaft Mixer is manufactured in accordance with the Good Manufacturing Practice (GMP) rules. There are no blind corners in the unit, which eliminates any possible residue. All parts that come in contact with the product are made of stainless steel, and they are easily accessible and removable. The whole unit or any of its parts may be sterilized by steam. The double jacket has connections for water, steam or thermal oil. Facilities for permissible operational pressure are included to purchaser specifications. The installed baffle plates between the vessel and jacket walls improve heat transfer and reduce the heating and cooling time. A complete and fully operational temperature control system which can be simply connected to power, water and steam is available at extra cost. The measuring instruments are supplied with each unit: thermometer, vacuum and pressure gauge. 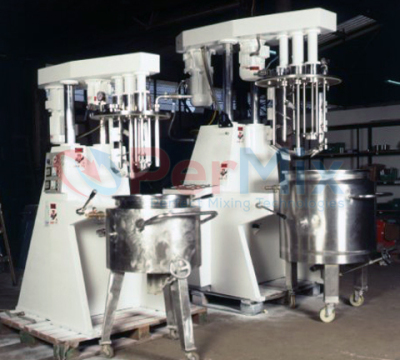 The PerMix PMS series Multi-shaft Mixer serves a wide variety of industries, such as the pharmaceutical and cosmetic industry for the production of emulsions, ointments, lotions, pastes, creams, suppository compounds, eyeliners, make-up, shampoo, shaving cream, toothpaste, etc., the food industry for the production of ketchup, mayonnaise, salad dressings, cream cheese, various concentrates, etc. and the chemical industry for the production of shoe polishes, sealing compounds, car cleaners, suspensions, etc. The PerMix PVC series Vacuum Homogenizing Mixer performs the same functions for food industry applications.